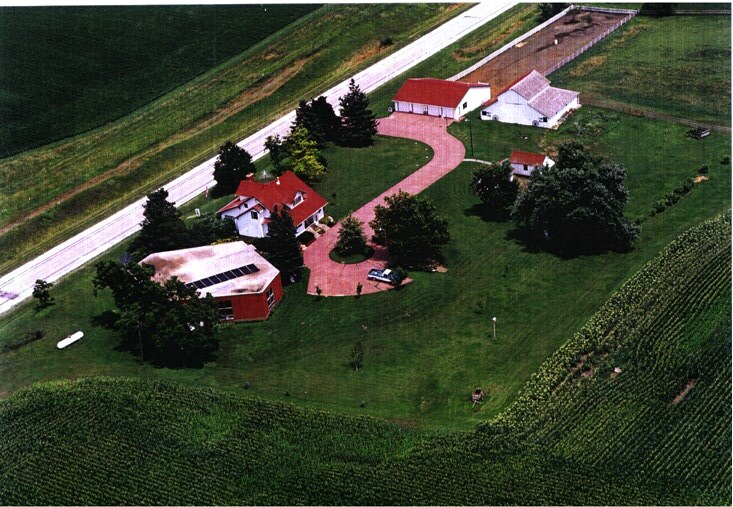 In October 1996, I became the proud owner of the 18-acre Windcrest Farm near Greenfield, Iowa, just a few miles from the famous Madison County covered bridges. My mother, Margie Moore, is now managing the property and operating it as The Brass Lantern bed-and-breakfast inn. Besides the 1918 farmhouse, four-car detached garage, and farm buildings, the property has an adjoining building containing an additional large bedroom, a two-room suite, and a 40-foot indoor swimming pool. This is the hexagonal building at lower left in the picture below. The B&B previously operated under the name The Wilson Home, after the family that developed the property. (Mrs. Wilson, the last owner, and her son, the former operator, are related to Henry A. Wallace, U.S. Vice President under FDR, 1941-45.) We decided to pick a suitable new name for the inn, so we held a naming contest! The Brass Lantern came away the winner. Even so, if you have a suggested name, mail it to me. The B&B is listed on the Web. The Wilson Home also has some Web listings.